Plex Tuning / Uncategorized / HPAcademy Promo: Win a PLEX uSDM-102 Pro plus an HPA Tuning Course Package valued more than 1065USD! 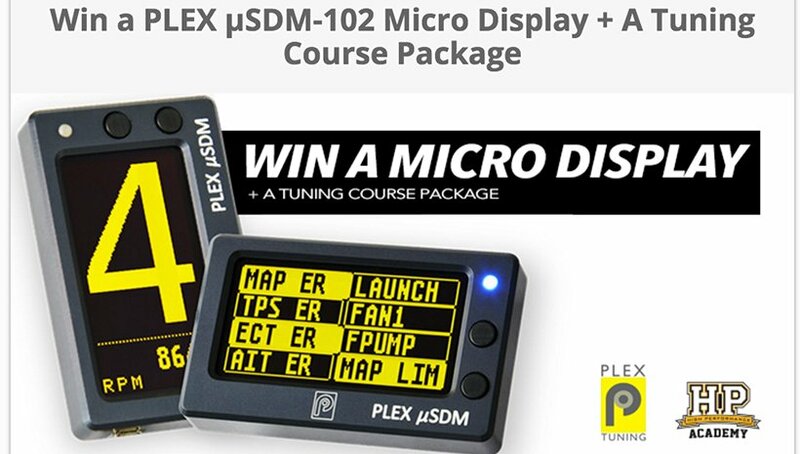 The New Zealand based High Performance Academy (HPA) has just launched a killer promo that offers a new PLEX uSDM-102 Micro Display along with a Tuning course package, both of which are valued at more than 1065USD! Join today and take your chances to be the one who wins this unbeatable offer! HPA founders Andre Simon and Ben Silcock cut their teeth and gained first-hand experience running a world class performance workshop tuning thousands of high performance cars. Their experience taught them how poor the current level of tuning knowledge was in the industry. From there, they established a classroom based course to teach the fundamentals of EFI tuning. Worldwide demand grew and they made the decision to start HPA to focus solely on providing accurate, quality EFI training solutions that are easily accessible to everyone. The HPA currently offers a wide assortment of entry-level and high-level online tuning course along with frequent and free webinars on key industry topics. It also nurtures an interactive online community/forums with thousands of members from every single part in the world. To find more about their courses, click here. This is our new 2.4” OLED micro dash display & logger that features many of the functions found on our 4.3” Displays/Loggers (SDM-300 & SDM-500). Despite its compact size, the PLEX uSDM-102 is trusted as a full-fledged, motorsport quality micro display and logger and used in many pro-level projects/applications. The fact that it can function both in horizontal and vertical modes, makes it also a preferred choice among those who need a solid gear indication display that doubles as an ECU monitor. 549 Euros excluding VAT, shipping & handling.